The service was attended by a small group of people, two nuns, a novitiate brother, priest and 10 or so congregants. The service was conducted with most of the people sitting cross legged on a splay of beautiful carpets, circling the officiants who conducted the service. Several passages of scripture were read in Kurdish, followed by the homily and candle lighting. As each candle was lit it was followed by what sounded like an Ave Maria. Here I have to admit, the service was difficult for everyone. 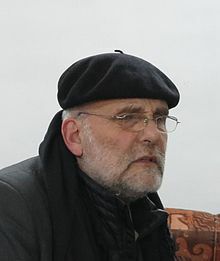 With what I’ve gathered from other CPTer’s, both those who’ve left team and the one who is with me now, is that Father Paolo has had a significant influence on CPT here in Iraqi-Kurdistan. My companion related that at least one individual joined CPT as a direct result of his influence and numerous others have used his guidance to help them deal with the stressors of being on team. Plus he has helped developed a respectful relationship with the Muslim community by initiating interfaith dialogues leading to mutual understanding. I would ask people to please include this remarkable man in your prayer’s for a safe return to the monastery and success in the work he’s trying to put forth in finding a path to peace for all those impacted by the Syrian conflict. Hi Sandra, Thank you for sharing this about Pater Paolo. The German delegation tried to contact Pater Jens to show our support, but were unable to reach him. Would you kindly let him and the others know that they and Pater Paolo are in our prayers. We had such a wonderful evening of sharing with them, when we visited in May. Zor spass. Thanks so much, Sandra, for your description of the service for Father Paolo, and for the links that help to introduce him to us. It’s quite amazing to encounter such persons of faith and courage almost anywhere in the world, where there is need for fearless, bold, healing presence. Looking forward to seeing you back in Elkhart before long.